Savory breakfast month is coming to a close! 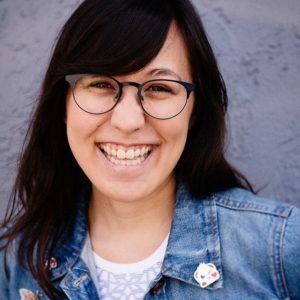 I can’t believe how fast it went by. 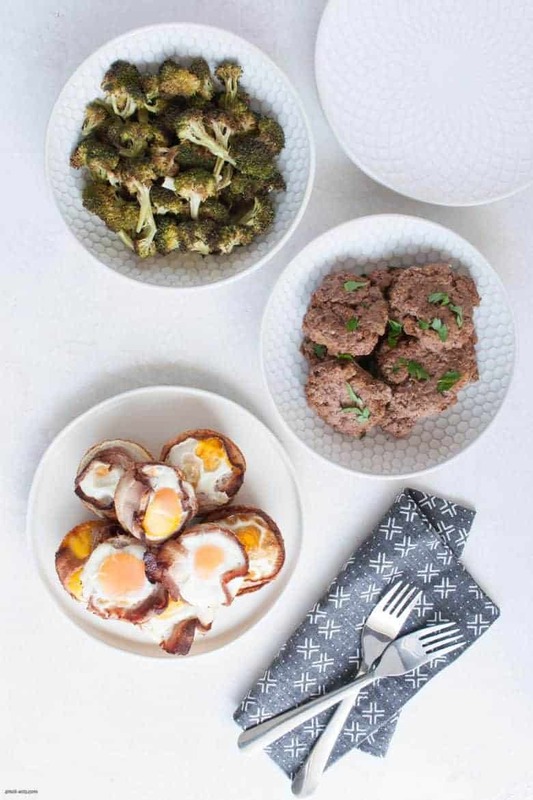 I hope these breakfasts have given you some ideas on what to try to see how you feel with a savory, protein packed breakfast instead of the “normal” Western breakfast. For the last recipe for this savory breakfast month, I wanted to go all out with something delicious and fun. 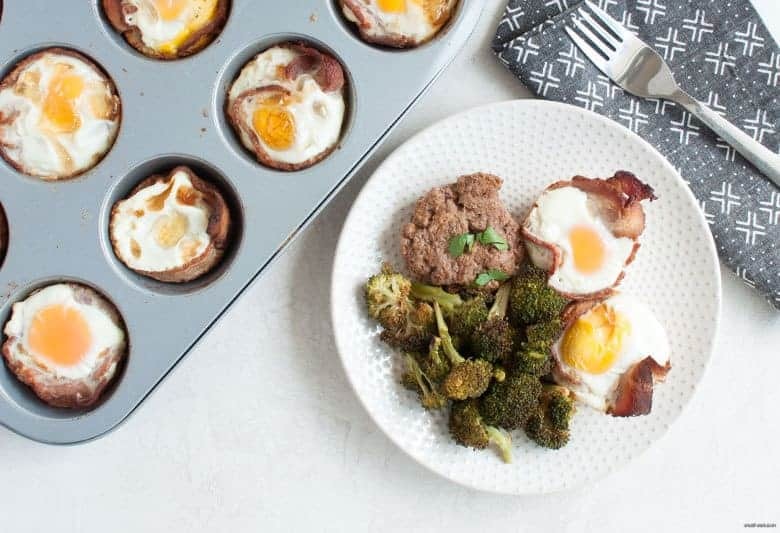 This Bacon and Egg Muffins and Breakfast Sausage savory breakfast checks a lot of boxes. It feels fancy and indulgent like a weekend brunch with the realness and portability of a weekday meal. Also, by having eggs, bacon AND sausage, you’re giving yourself a good amount of protein to start your day. Starting off your day with protein (and fat) provides you with a slow and stable energy source to last way longer than any bagel, bowl of cereal or donut could. All foods provide us energy (a calorie is a unit of energy), but not all foods provide us the same quality of energy. For lasting stable energy, proteins and fat are the way to go. They’re like big logs that will burn for a long time. Carbs, on the other hand, are a very quick, short energy source. That can be great when you’re doing endurance events, but if you’re just living your life, at work or doing something non-sports related, it may not be so great. It’s a lot like kindling for a fire. You’ve gotta add a lot of pieces, constantly, to keep the fire going. 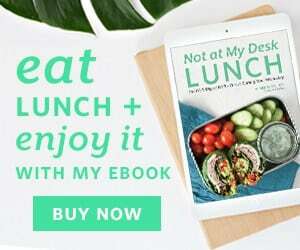 If you want to have sustained energy throughout the day, feel more full, and not have as many energy crashes, make sure you’ve got a enough protein and fats on your plate. A good ratio to start with is 30% protein, 30% fat and 40% carbs. Depending on your body and level of activity, you may have to adjust these ratios a bit. You may also have to, overall, increase the amount of food you’re eating. Experiment and see what works for you. 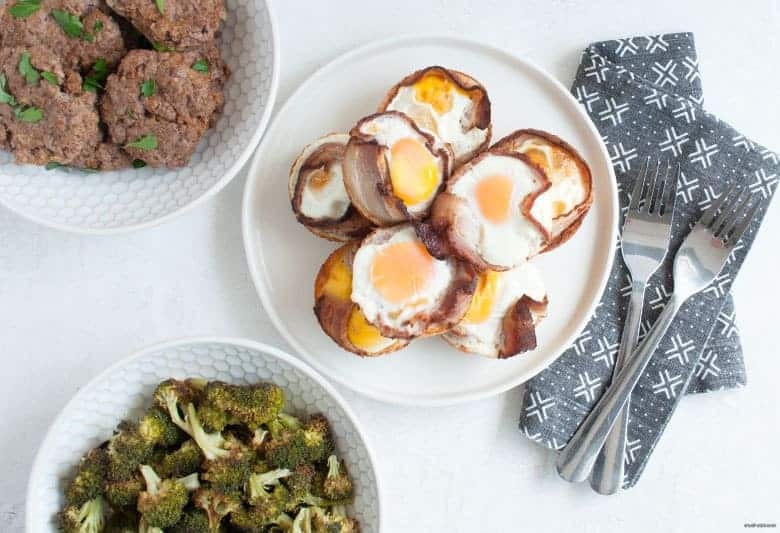 What is great about these Bacon and Egg Muffins and Breakfast Sausages is that you can easily add more to your plate as you figure out what works for you. This recipe makes a lot of muffins and sausages so you can feed a few people or yourself for a few days. You can easily experiment with how much you need to eat with this meal. And you can also easily half this recipe if you need to, it’s pretty flexible. You can also make just one component and add it to any existing meal. 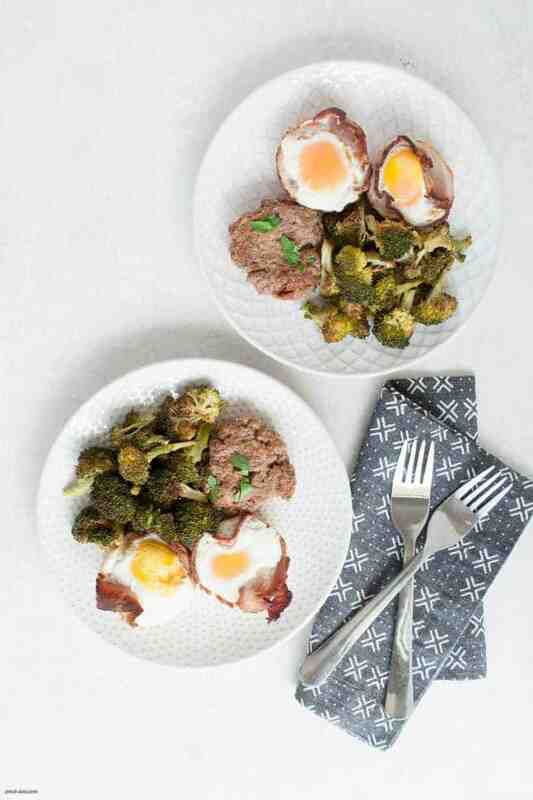 Maybe you just want to add the Bacon and Egg Muffins to a meal or just the sausage, do what works for you. I paired this with roasted broccoli for added veggies to round out this meal, you can pair it with any roasted veggies you prefer or are in season. If you’re prepping this for the week, you can also prepare two kinds of veggies if eating the same kind gets boring to you. Something that is helpful to stick with is par cooking (or partially cooking) the bacon before putting it in the muffin tin. From making this recipe a few times, I can tell you putting the bacon in raw isn’t the best idea. If you don’t render some of the fat down by par cooking it, that fat will release (and overflow) all over the cups in the oven. It doesn’t affect the taste, but can turn the inside of your oven into a hot hot mess. You’ll cook the bacon very quickly so some of the fat is rendered out and that’s all. I’ve also made it where I cooked the bacon a little too long in the pan and then it wasn’t flexible enough to put in the tin. So just a quick cook and you’re good. And if you’re also making the sausage patties, make the bacon first, then the sausage patties. That way you can use the bacon fat to cook the patties, which is pretty damn tasty. Rub inside of muffin tins with cooking fat. Bring a skillet or cast iron pan to medium heat and par cook 4-5 strips of bacon(depending on the size of your pan), 1 to 1 1/2 minutes on each side. Transfer a paper-towel lined plate and continue with all of the bacon. 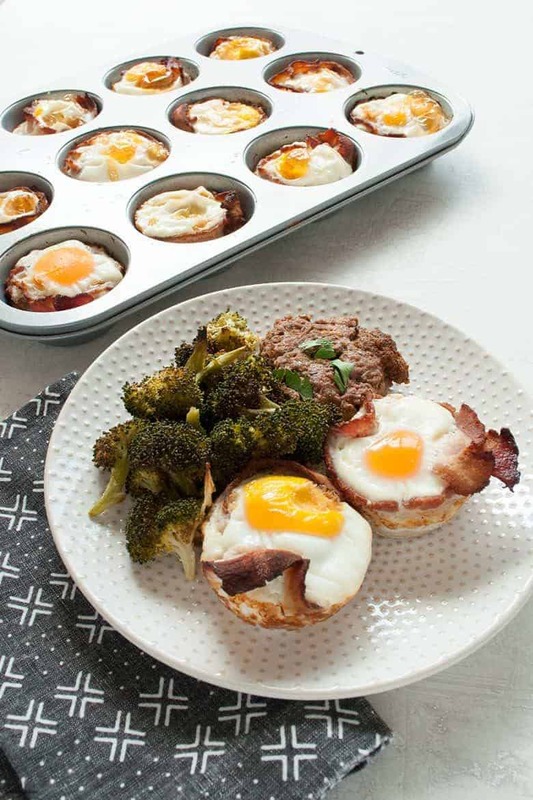 Line each muffin tin cup with a strip of bacon, then carefully crack one egg into the center of each cup. Bake for 20-25 minutes until egg is cooked. In a large mixing bowl, combine ground beef and all spices, mixing thoroughly until all the spices incorporated. Form 2-3 in patties. Bring a skillet or cast iron pan to medium heat with a teaspoon of cooking fat (if you're making this and the bacon & cups at the same time, use the bacon fat from par cooking the bacon) and add 3-4 patties into the pan (depending on the size on pan). For a medium rare sausage, cook for 45 seconds to 1 on each side (especially if you're going to reheat these during the week). If you're enjoying right away, cook for 1 minute to 1 and a half on each side.